Sometimes getting out of the city is just what you need on the weekend. A change of scenery and a slower pace of life always does the trick. 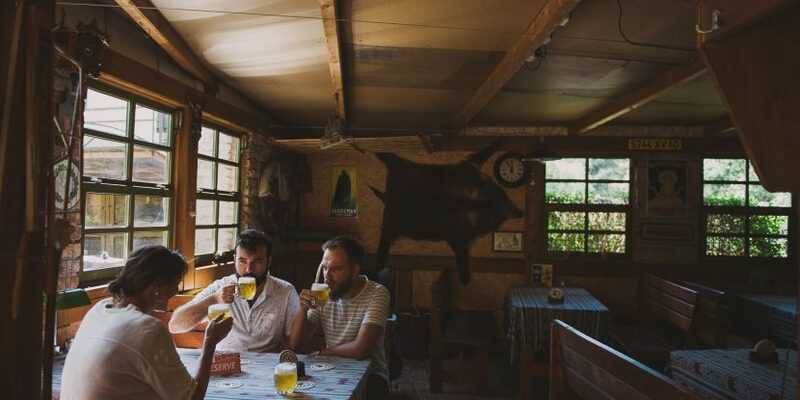 Here we will take you on a great beer and food pilgrimage through a couple of quaint Bohemian villages that lie in the northern suburbs of Prague. 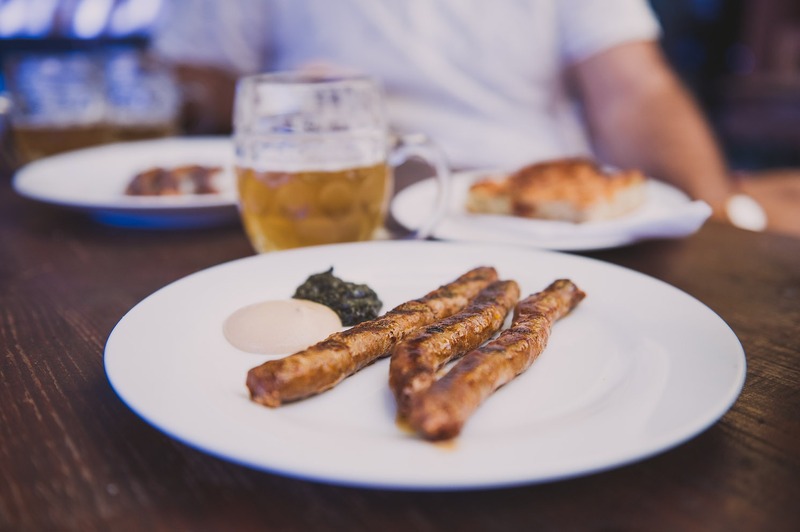 We have three excellent stops for food and local brews coupled with a forrest walk along the Únětický potok (or creek) connecting the villages of Roztoky and Únětice. 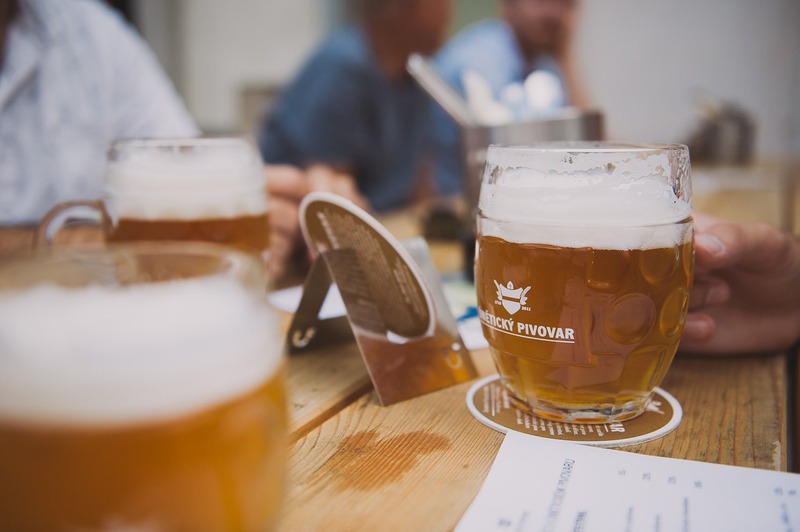 Each of the stops are special in their own right, offering a local atmosphere with the final stop at a well-loved brewery, "Únětice pivovar". As you head north, hugging the Vltava the city melts away and an entirely new scene of green floodplains and rocky cliffs, dotted with a biker or two and a few aged chateaus. You might as well be 100 kilometers away from Prague, let alone ten. 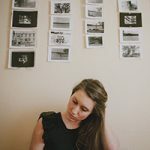 It is something special about this city: the surprising connection, and access, to nature all within city limits. Here, we are headed up on the train to the very outskirts of the city to get the best of Czech culture - beer, food and nature. If biking is your fancy, it is entirely possible to make this trip from Sir Toby's (see end of article). Hop off the train (or bus) at Roztoky and you can instantly begin your trek. Head back in the direction you just arrived from on Lidická (If you need a coffee pick-me-up, you will pass an inviting looking cafe called Kavarna Koffii on your left with your standard coffee drinks.) When you arrive at on "Tiché údolí"make a right and continue on for about a kilometer until you reach your first destination, a cozy hospoda, (pub in Czech). This cozy pub is run by a family who lives on the premises. It feels as if you are entering someone's private garden, however the bright yellow "Černa Hora" umbrellas are a giveaway that it may in fact be the first watering hole to make a stop at. Pass the pen of rabbits and the friendly, resident cat as you make your way into the cozy hunters pub adorned with knick-knacks, wood furnishings and animals furs that make you feel like, this is Bohemia. We are not sure what to attribute our first stops namesake "pub animal", as it translates, to the presence of animals and or the selection of local game on the menu. If you are looking to try something from the Czech countryside, with place offers faire to appease such desires. Personally, this is my favorite stop on the trip, all owed to the lamb sausages that come perfectly with a mint pesto-like sauce that makes you wonder why it took you this long in life to find something this delicious. Grab your first half liter of Únětice 10 degrees and some Kulajda soup (or really, just about anything they have on the menu) from the bar inside, and indluge before you head through the forest. After leaving Hospůdka Zvířátka with teasers of what is to come, walk about 300 meters until the road ends and you are greeted with a small path that disappears into the forest. Once again, the scenery entirely changes, and the hot sunny day we were once part of has turned cool in jungle-like world with the tall canopy of trees enveloping you. Follow the creek and stay on the trails marked with a blue line sandwiched between two white ones (should look like three stripes). 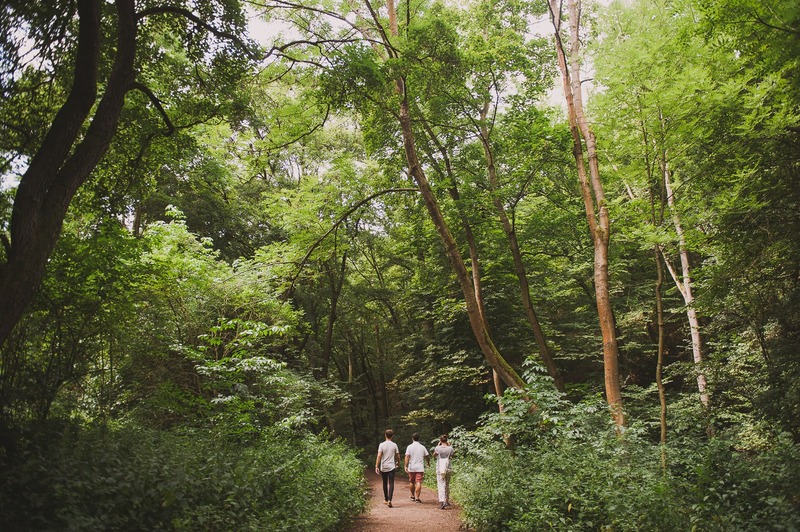 The walk through the nature stretches for about a kilometer. Continue on this trail until you reach the another road with the same name, "Tiché údolí" and continue another 1.7 kilometers while marveling at some stunning abandoned chateaus mixed in with other well loved, Bohemian complexes giving you a taste of Czech village life until you reach our next destination. Our next stop is a loved by bikers, as it also doubles as a penzion (an inn) for cyclists making longer treks across the Czech Republic. Here you have a courtyard made up of a mismatched collection of worn-in furniture that give it a cozy atmosphere. 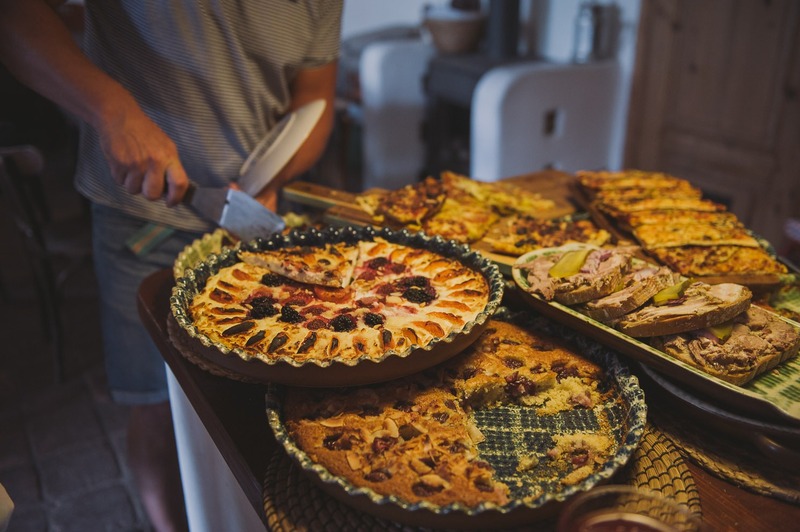 Head inside and take a look at the kolač, a Czech style pastry that is can be sweet or savory. Here, you can make your childhood dreams come true- and have dessert before dinner. Their kolač with fruit and tyvaroh (a less sweet, cream-cheese like ingredient you will find in many Czech desserts) is not to be missed, especially if you are looking to taste something close to this country's heart. Pro Tip: Save this stop for last, and fill up on as many sweet kolač, as your heart desires. Once leaving our second stop, follow the white signs with "Pivovar" to be lead to the mecca of Prague breweries. What Pilsner is to the Czech Republic, Únětice beer is to Prague. Ask any Praguer what their favorite local brew is, and likely you will "oon-ye-titz-ay" as your answer. 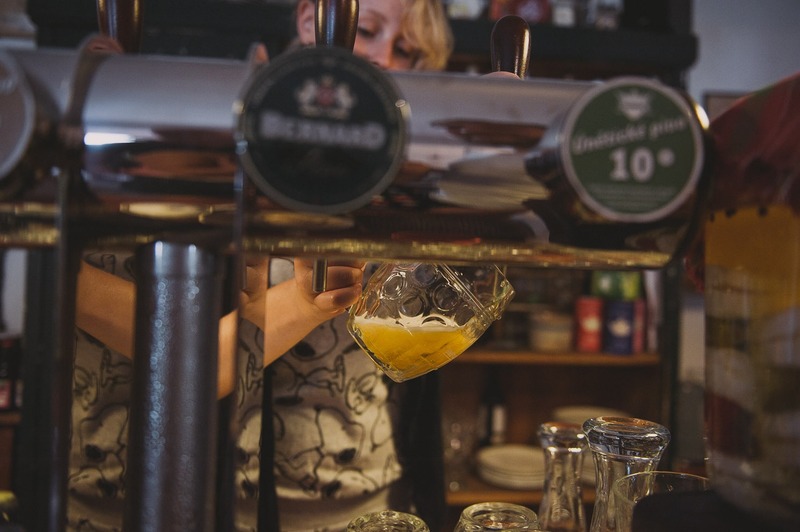 This lovely local watering hole is one of the most popular breweries in Prague- known for their beer, however their brew-restaurant holds a candle to their delicious beers. Here, we usually indulge in a main course, or pick several "beer snacks" to share while sucking down a few half-liters of their golden juice in each others company. Often times on the weekends, the brewery hosts events with the most popular being Masopust celebrtion in February. Public Transport: There are several public transportation options allowing you to reach Roztoky. Easiest might be taking the S41 train, which runs every 30 minutes from Nádraží Holešovice and takes about 10 minutes. Nádraží Holešovice is easily reachable from Sir Toby's on the 6 Tram from the tram stop near Sir Toby's door. Another option is to catch the 333 Bus from Dejvice Metro Station (on the green line) which runs every 20-30 minutes during the day and takes about 20 minutes. Upon reaching your destination at Únětice Pivovar, you may choose to follow the same path back to Roztoky, walking all those calories off, or catching the 355 bus, which runs every 30-60 minutes during the day and takes about 24 minutes to reach Dejvice Metro Station. We do recommend checking bus and train times prior to your trip as they can vary depending on time of day and are subject to change. Bike: For all you bike enthusiasts out there, here is how to make your way to Roztoky on two wheels. Head through Holešovice, and then cross the river via Trojský bridge to get to the A1 cycling route that follows the Vltava as it wraps around beautiful Troja. When you reach Sedlec, take the ferry back across the river, and continue on until you reach Roztoky. The whole journey is approximately 15 km one way.